Pastry cream is a custard (made through the process of cooking together cream or milk and egg or yolk) and can take a few tries before you feel comfortable with the process. The mixture should be heated over gentle heat – it may clump up or curdle if heated too quickly. If you are worried about heating it too quickly, you can use a double boiler to make sure the heating is slow and even. Generally the pastry cream begins to thicken at about 70°C and should not get higher than about 80°C. A few degrees can really make the difference between perfect custard and a clumpy ruined one so this is definitely not a dessert you leave heating on the stove and walk away. Since this pastry cream has cornstarch in it, the mixture should be boiled, over gentle heat, for at least one minute to activate the starch which will result in a very thick pastry cream. If you would like to thin out the custard, you can some whipping cream to thin after it has cooled. 1. 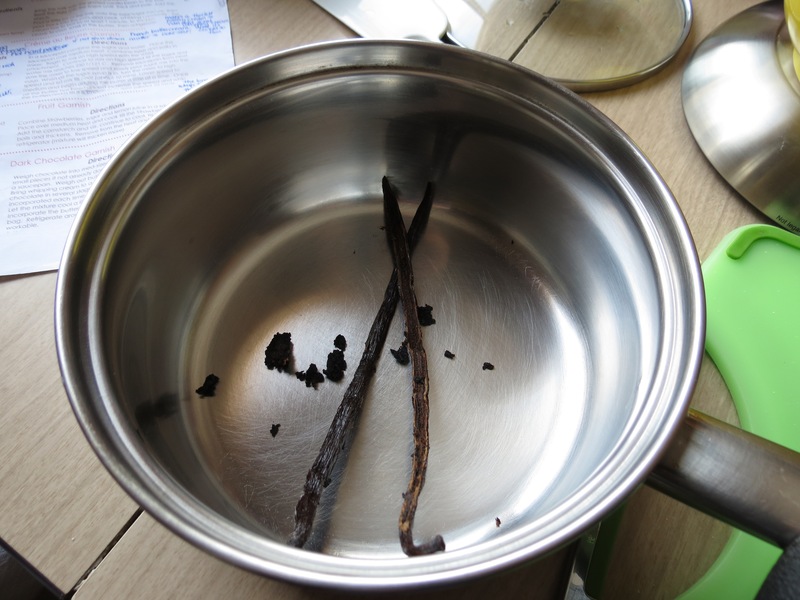 Cut the vanilla bean in half lengthwise and remove seeds by scraping with dull side of a knife. 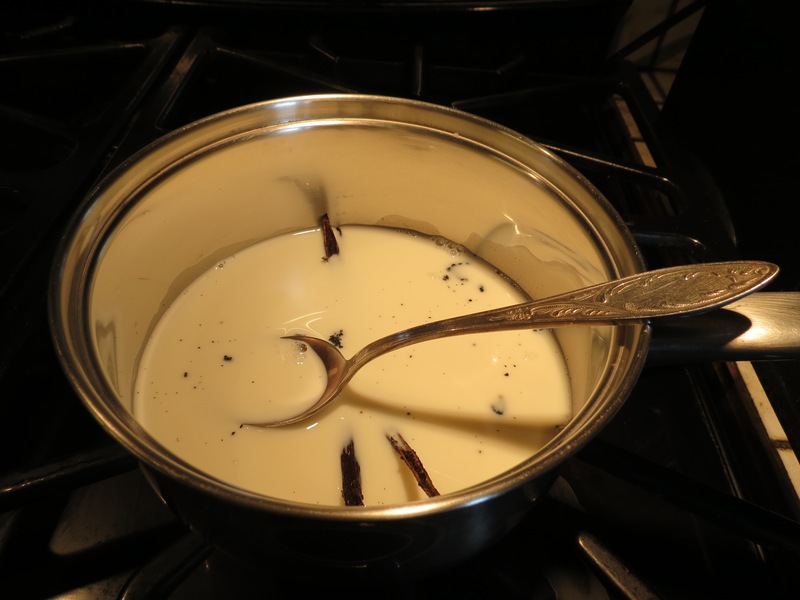 Place the vanilla bean and milk in a saucepan and bring to a boil. 2. Beat the egg and sugar together until the mixture becomes pale and thick. Add the cornstarch and mix to distribute. 3. You will now need to temper the eggs with the hot milk mixture. To ensure that your eggs do not cook, add a small amount of the hot milk mixture to the beaten eggs and whisk to combine. Once the eggs are tempered, pour the eggs into the saucepan with the milk and cook over gentle heat, whisking constantly. 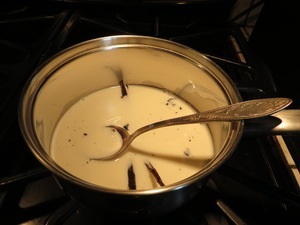 Continue to whisk until the cream thickens and has come to a gentle boil for at least a minute. 4. Allow the custard to cool until no longer hot but still warm. 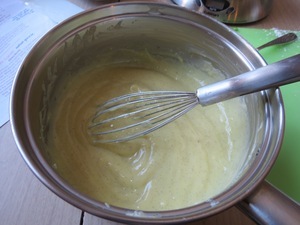 Add the butter and whisk in to combine (the custard should still be warm enough to melt the butter). Refrigerate until cool before using. Really cool Genia, the web page looks great. All this talk about pastries is making my mouth water!